Our Decorative clocks are hand enameled and many are accented in 24k gold. We have many clock styles available including desk clocks or wall clocks. The Spanish clocks come with or without a wood frame and some are made from our Spanish plates. They make for a truly unique gift that anyone would appreciate. Our clocks typically use one AA battery for operation. 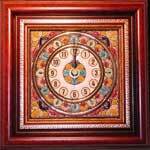 Our Spanish ceramic clocks can be hung from the wall using the clock hanger provided on the back of our clocks. To display the clock on a desk, you can use one of our plate stands. If you need help deciding on the correct plate stand, send us an email or give us a call and we'll help you pick out the most appropriate stand for your needs.